Some people tried to avoid Skype (and Facebook, Gmail, etc.) long before Snowden’s leaks, but most never cared and still don’t. And when you are the only fool abandoning Skype, you don’t really have anyone online to communicate with. Even if it’s only for chit chat and sharing your 9gag links. So how do you make the move less painful? You create a bridge between Skype and XMPP! I made a small Python script that sends messages between XMPP and Skype chats. 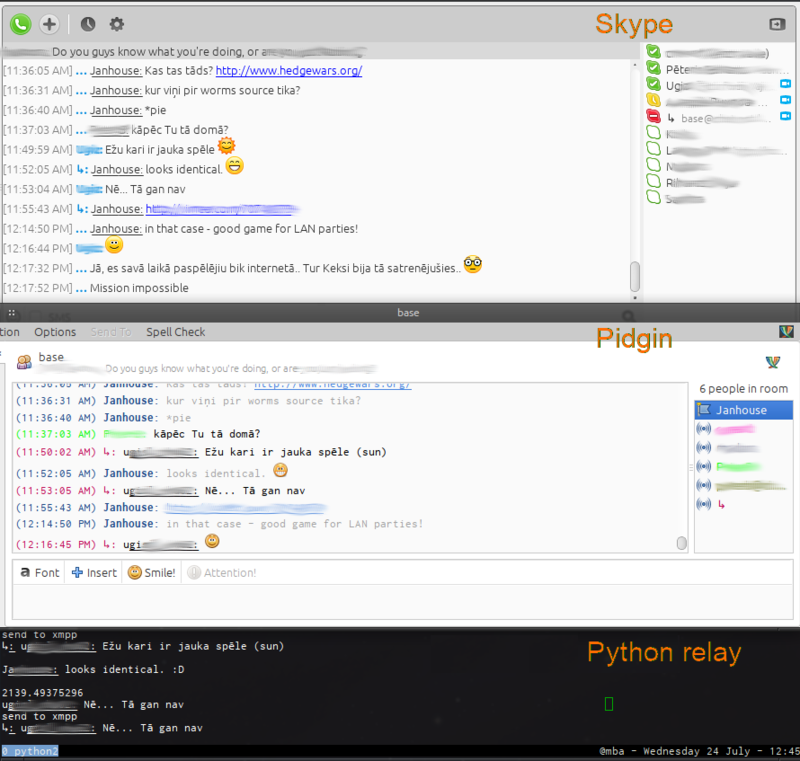 At the moment it uses Skype4py and python’s XMPP library to act as a client. It would be cooler if Jabber’s part would get integrated in the XMPP server itself, thus allowing to simulate Skype users as real XMPP users. But I probably won’t do it because it takes too much effort and it already works the way it is. Yes, it leaks stuff to Skype, so this should only be used for more or less public chats. After I clean up the code a bit, I’ll put it on Github. P.S. And making these bridges actually encourage more users to migrate to your XMPP server. Hi, did you release the tool yet? I’m really interested in that since I don’t like Skype interface in Mac.